I thought I would never get my hands on a copy of this, so big thanks to Sharon from @ShazsBookBlog for sending me a copy!
" My mind surrenders to an army of schizophrenic thoughts. Rationally I know that I'm dead, that Max is a widower, that he's free to pursue other relationships. Rationally I don't want him to be unhappy, in mourning and lonely forever. But those rational feelings aren't sufficiently robust to repel an onslaught of irrational impulses, that Max has betrayed me, that he's moved on too quickly, that he's desecrated the memory of our marriage with this act of emotional and physical treachery. And stoking the flames of envy's fury are those repetitive, invidious images of what I presume took place last night. " This novel explores the deepest thoughts of Rachel, as she has no choice but to be a witness at the changing lives of her family. We see Max and Ellie try to move on with their lives but we also see Rachel's mother, who is grief stricken and alone, many miles away from her grandaughter and any link she had to Rachel. We also see Rachel's best friend, of many years, as she struggles with Max's new life and all that entails. The main characters, however, are Max and Ellie. 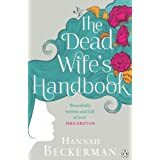 When I read the first few chapters I couldn't help but think of the discussions I have had with my own husband about whether I would want him finding someone new after my death, or whether he should stay a faithful widower. We are expected to say we want them to move on with their lives and find happiness if we are taken from them early. That may not be what we are really thinking though, as to watch the love of your life meet someone new scares the hell out of some of us. Maybe we would never know. May not be able to see anything when we have passed on. Who knows? This novel will make you think about it a bit more. It might even make you appreciate what you have, even more than usual. I knew the minute I started it that I would be delving into my soul to see how I would react in that situation.... Well done Hannah on a beautiful and insightful novel !! !